With that, what came next was unavoidable. The pace of new technologies accelerates as man claws their way back from the dark ages of the Purge. The lack of education the average person receives leaves them incapable of understanding even the basic principles of how some of these modern machines work. This allows fear to take root, and that gives the Dark power over these technologies. Infecting a machine, computer, or other piece of technology the Dark Lucid twists its shape and function into a nightmarish mockery, channeling the collective fear through the device. This terrifying image chills those witnessing its change, and ultimately leaves the device a melted husk, destroyed. The Character Rolls as with Nightmare Sense versus a target equal to the target object’s PV + 10. On a Successful roll the object bubbles forth as a horrid gateway to the Dark. Those within range witnessing this change must make a Mental Tree Roll (using Iron Will or other appropriate supporting Characteristics) equal to the Character’s Intelligence + Intimidation + Iron Will. Those who fail this Roll suffer a penalty to all rolls equal to the Character’s Intelligence + Iron Will. This effect lasts for 1 Turn for each 4 Levels of the Character’s Maintenance Skill. Note: The device targeted stops functioning only at the end of the effect. While terrifying someone may still attempt to use the impacted device. If the Character using the device is not already affected by the fear, they must immediately roll again, increasing the Difficulty by 10. When creating this Boon there were a few things I wanted to accomplish, first it needed to emulate the image, but should have a larger scope.Although, a Boon to destroy cellphones works well for the Dark, I mean, that cuts off lines of communications, it felt to narrow. Instead this was expanded to technology in general, this gave the Boon more functionality but kept it in line with Technophobia. While both Craft Nightmare and Modern Fears would place a Fear Penalty on targets within range the new Boon needed to feel different. For that it was back to the source image. The cell phone was clearly destroyed, so that became part of the Boon. Finally, the time the Boon would last was designed to again separate the two Boons. The duration was set based on the Maintenance Skill, while Craft Nightmare could be sustained for much longer. Lastly, to prevent the Boon from becoming too powerful, and to add a bit of ick, the object affected would continue to function through the duration, but ultimately be destroyed. To determine the requirements we looked at what was already included in the core book, here we found Craft Nightmare, this Boon provided a general framework for the mechanics of the Boon. Modern Fears was not intended to be as powerful as Craft Nightmare so while it maintained the same Boon Requirement, Nightmare Sense, Maintenance 12 was added to differentiate between the two. Lastly, the Energy Cost was also based on Craft Nightmare. Craft Nightmare has a Cost of 10 energy per Turn. A Character with the base requirements would create a Fear Effect lasting for 3 Turns, 30 Energy if this was Craft Nightmare. However, Modern Fears also destroys the object affected. Instead of just increasing the Energy cost, a Health Cost was added, this keeps the raw Energy cost from scaling too high allows the Dark Character to use the Boon several times, but keeps the cost meaningful. Adding a Health cost to a Boon that destroys is also Thematically fitting with the Dark. This year at Dragon*Con we will be running 6 introductory games in Non-Campaign gaming based on the Adventure Seeds series. These games are designed to give new players a sense of the world and what it means to be Lucid. 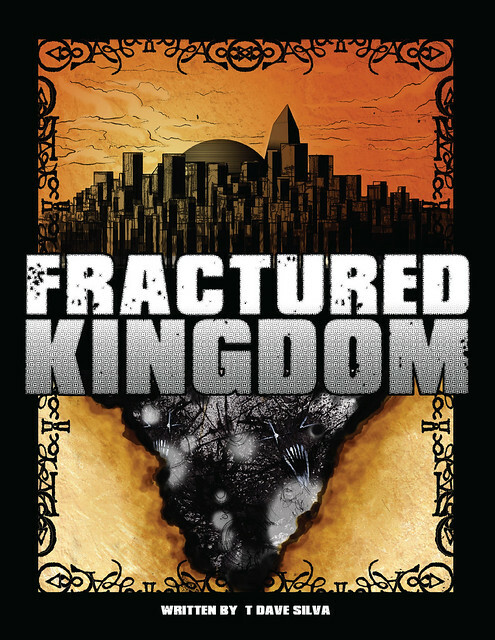 Just got a chance to listen to this review of Fractured Kingdom from 2 GMs 1 Mic, and it was awesome. The show is broken down into several segments covering, the show’s topic, game reviews, and their campaigns. You can jump to the review at 29 minutes but I recommend listening to the full show. There are some awesome quotes in there, but I don’t want to spoil anything. A big thanks to 2 GMs 1 Mic for the review. Near the heart of the Reclaimer movement in Atlanta, Georgia, ASA were any number of small towns. Just across the Georgia/Alabama border is one such town, Anniston. Before and throughout most of the war Anniston drifted along, another sleepy town well removed from real conflict. When the ASA began military operations in Mexico long simmering tensions erupted. What had been a sleepy paper mill town exploded in racial tension. At first attacks were subtle, targeting the poorest Hispanic families. As the conflict in Mexico escalated and spilled into Texas so did the attacks on innocent people inside the Anniston going so far as to see a resurgence of the Klan and events such as public lynching’s. 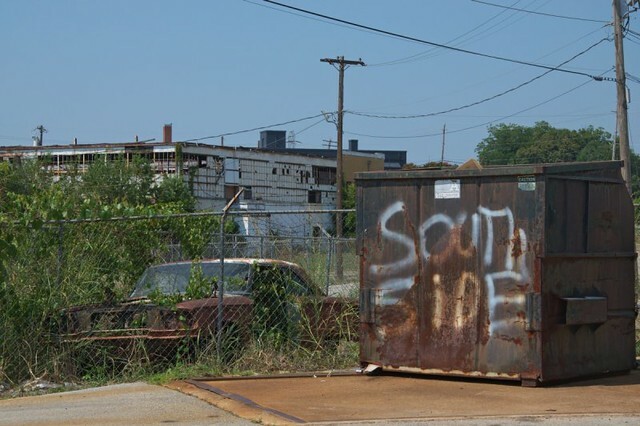 This racial violence was not unique to Anniston, as crimes targeting Hispanics surged across the ASA, particularly in the Southern states. As the US continued to destabilize leading up to the Purge, the Church of the Reclaimer took up roots in Anniston. Religious fervor tapped into the fears of the town and was able to shape it. In the years before the Purge Anniston was a central training facility for the Church’s bombers. Coordinating with other small and medium sized towns already affiliated with the Church thousands of sleeper agents were decimated through the US, and then ASA leading up to the Purge. The years that followed the embargo and reassertion of national governments have not been kind to the people of Anniston. For years, the city was home to a host of investigators, law enforcement, and mercenaries conducting sweeps searching Church radicals and militants. The post war economy of the city all but non-existent. Government aid was brought in to support the survivors. For all this Anniston has not fallen into the obscurity of history. Much of the city remains a burned out husk of its former self. While Atlanta has licked its wounds and covered over its scars Anniston was never able to fully recover. Because of this, there has been a steady growth of Post War tourism, people looking to explore the horrors of war, without the dangers of the Wastes. This has made Anniston ideal. Memories: While the Church’s influence may have been scrubbed from the surface, there may still be a strong underground presence within the community. This underground faction may be looking to recruit muscle willingly or not. PCs displaying any kind of supernatural ability may find themselves kidnapped. Lost Souls: A fog of regret and misery floats over the town of Anniston. This is a real effect left over from of those that died in the town during the Purge. While not an actual Bridge or Gate with the right influences one may easily form. For this reason the Templar, Spirit Callers and Keepers have all taken interest in the town. While neither faction has made a move yet, the Templar and Callers sit on the edge of a discovery the Keepers are sworn to prevent. The Lucid Effect presents a new Lucid, first with only mundane abilities that encapsulate their former lives, and a possible incarnation with supernatural talents building off their previous skills. The Basic Template spends only basic Character Points and 5 Lucid Points. The Lucid Template fills out the character presenting a near complete New Lucid. It’s perfectly reasonable to cat around with this kitty causally. While it’s far to easy to fall into the grand debate, Eartha Kitt or Julie Newmar we’re looking at a different kind of cat lady this week. This is the recluse that lives for their kitties, yes, they live, work and function in everyday society it’s only marginally true. This is someone completely dedicated to their pets and while it doesn’t have to be cats the Cat Lady is one of those iconic images we couldn’t resist. To take care of her cats our lady has chosen a rather reasonable career as an accountant. Something she could mostly do from home, allowing her more time with her pets. We give her Law, Logic & Math as well as some social skills to ensure she’s both good at her job and can feign normalcy. After that we look at some kitty quality skills. Animal Handling, Domestic, and Study: Cats are all easy choices. Knowing how to care and clean one;s animals is important. To that effect we add in Zoology to represent a mildly obsessive study of the various breeds of cats. We round this out with Perception, Scrounging, and Fasting, for finding missing cats, and dealing with the lean times when money is tight due to kitty issues. Now, what’s better than your average ordinary cat lover? Why one that summon up her own pride. How our Cat Lady came to be touched by the Verdant we don’t know. However, we do know that she travels with a pack now. Faithful Lynx by her side, she can call up a pack of feral city infused with her Verdant energies cats capable of easily overcoming the average mundane. The Cat Lady represents a specialist character. Driven to do one thing closely linked to her concept the scope of many of her Boons are limited to only her feline friends. No self respecting dog fears the Cat Lady, but they should. The Cat Lady uses all 60 Experience as a New Lucid. The year is 2202; over sixty years have passed since the end of the Great War and the Purge that followed plunging the world into a modern dark age. Since then man has struggled to rebuild, to find some fragment of stability they had before the generations lost to war. For most, the world is a cold and cruel place, the gap between rich and poor ever widening. The masses, undereducated, placated with cheap distractions and great television. Under the static and the lies are other worlds, four Realms, the Dark, Grave, Slumber, and Verdant, places of fantastical beauty and horror. Secret places that share their gifts with those strong enough to take them. These are the Lucid, existing between the worlds and shadows. In the shadows, empires, known as Baronies, manipulate the world as they seek unknowable goals. It is here that secret wars unfold, unknown to the Waking World. It is here that only the most cunning may survive outside the control of others. It is here that one may find freedom. All it costs is everything else. 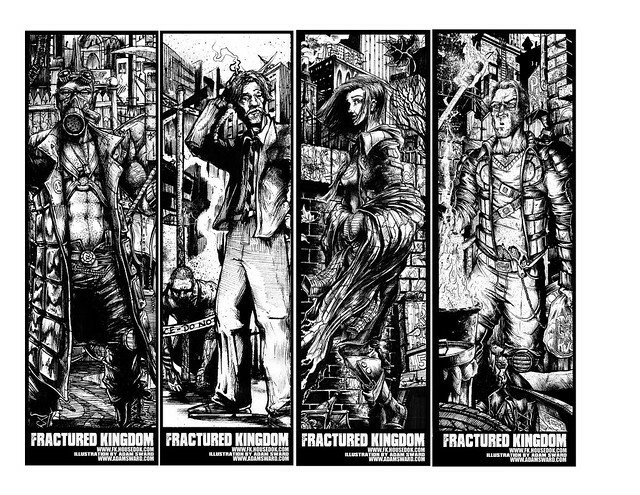 Blending action, conspiracy, and horror into a unique world, Fractured Kingdom puts the players in the heart of the mystery from the beginning. Players take on the role of Lucid, able to tap into one of the four Outer Realms they struggle to survive in the industrial landscape of 2202. Every shadow holds the possibility of new nightmares, and not even one’s dreams are safe. Fully detailed character creation using the new Open Action System, providing players unique of ways to customize their characters. 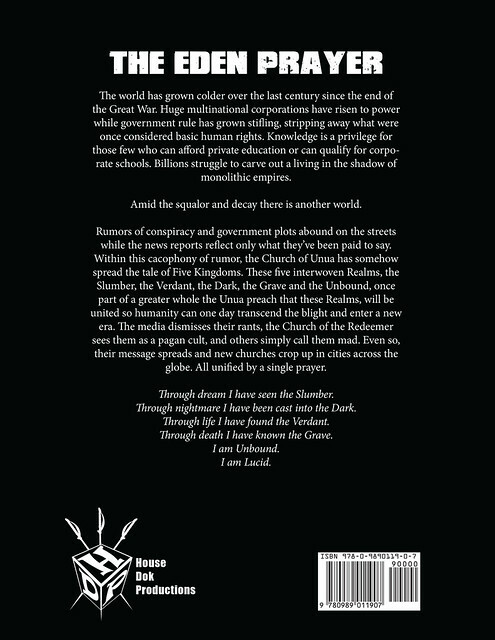 World setting, including details on the Four Outer Realms, supernatural places the characters draw power. Details on seven Baronies, shadow organizations that manipulate both supernatural world and events of the mundane. Creatures of the Realms along with antagonists, both mundane and supernatural. The Open Action System encourages dramatic play rewarding character’s backgrounds and player creativity. 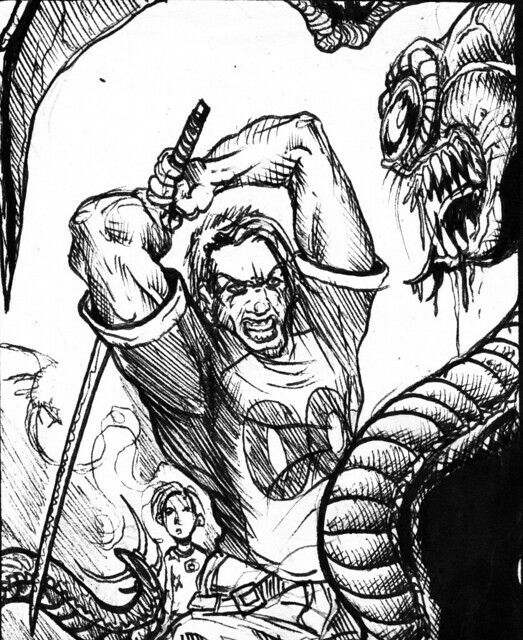 An introductory adventure for new players to put them right into the action including ready to play characters. 236 pages including artwork by Adam Sward.